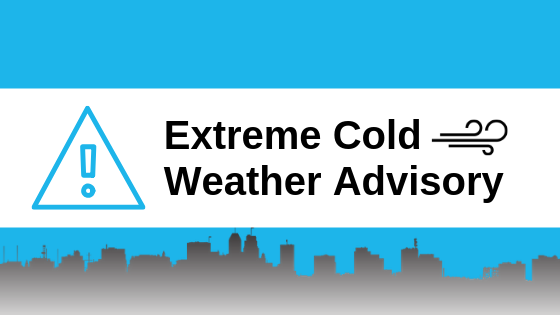 ‍Newark, NJ – January 20, 2019 – Mayor Ras J. Baraka and Department of Health and Community Wellness Director Dr. Mark Wade announced that “Code Blue” continues to remain in effect through Monday, January 21, due to the extreme cold weather. A wind chill advisory is in effect and temperatures are expected to drop overnight and reach as low as 9°F, with a real feel of -9°F Monday morning. ‍Code Blue is called whenever temperatures reach 25°F or lower without precipitation or 32°F or lower with precipitation. For more information on shelter locations, please visit City of Newark website: http://bit.ly/newark-code-blue or call: (609) 439-5210. In addition, Mayor Baraka reminded residents of the hazards of cold weather. “If you do need to go out, several layers of warm clothing and protection against moisture and wind are important, even though weather may not seem to threaten cold injury. Gloves and socks should be kept as dry as possible. Insulated boots that do not obstruct circulation are essential in very cold weather. Warm head covering is particularly important, since 30 percent of heat loss is from the head,” he said. · Check heating units. Poorly operating or damaged heating units can release carbon monoxide gas. Test carbon monoxide detectors for proper operation and battery life. · Watch for signs of frostbite, which include loss of feeling or pale appearance of fingers, toes or face. · Check on family, friends and neighbors who are at risk and may need additional assistance. · Watch pets closely and keep them indoors when possible. Animals can suffer from hypothermia, frostbite and other cold weather injuries. · For fire safety use flashlights, instead of candles. Please call the Department of Public Safety at (973) 733-6000 for all non-emergency weather-related emergencies. As always, dial 911 for emergencies. To contact PSE&G, please call their customer service line at: 1-800-436-7734.